Pat O’Toole and his brother, Coop, are on the run from an enemy that specializes in hiding in plain sight. Along with their new companion, Kate, they’ve narrowly escaped a cultlike community situated beneath the streets of New York City. 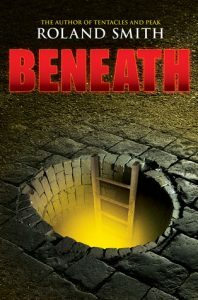 Kate has lived underground since birth, and the world above thrills her, but it’s treacherous as well. With the cult’s leader — Kate’s grandfather — on their trail, will they spend the rest of their days as fugitives? Who can they trust but each other? The adventure that started Beneath concludes Above in this action-packed thriller. 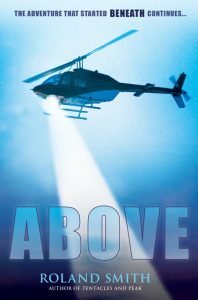 I just finished reading “Above.” I loved it! I had worked at a local bookstore for 16 years. It closed in October. I was finally able to get to Kansas City last week and bought the book at Barnes and Noble. I retired from teaching a year and a half ago after 41 years. I read many of your books to my students: “Zach’s Lie, Jack’s Run,” the” Storm Runners” trilogy, “Sasquatch,” the “Cryptid Runners” quartet, etc. After I retired from teaching, I reread “Zach’s Lie and Jack’s Run,” my favorites. I can’t wait for your next book!!! I am the Librarian at St. Margaret of York Catholic School in Cincinnati, Ohio. Many of my students enjoy reading your novels as do I. I am inquiring about your school visits to see if perhaps we could arrange on for next school year. I will add that we are a small Catholic School (K-8) with limited funds available from our PTO though. Could you please share your availability? Thank you for your time. I just finished Beneath and I am looking forward to Above. OH MY GOD IT’S OUT. Beneath was the first book that I read of yours that got me “sucked in” then I read The edge and Peak, etc. When I found out this sequel was out I had to get it first thing. Love your books!! Will their be a sequel to above? I’m glad you’re enjoying my books. Above is the only sequel to Beneath, but some of Coop’s descendent will be appearing in a future novel. You must read “Zach’s Lie” and “Jack’s Run?” I first read these two books in 2005 and read them at the beginning of the school year to my 5th and 6th graders every year until I retired in 2015. Since then, I’ve read them in July or August each summer. I also have read the Cryptid Hunter series and absolutely loved them! I met Roland Smith in 2005 and again in 2016. He is my favorite young reader/teen author! Thanks for the book suggestions!! I’ll definitely look into them!! Can you tell me when your next book will be published? Just BENEATH and ABOVE. Everything is wrapped up in ABOVE. No cliffhanger. I met Roland Smith in 2005. He was introducing “Zach’s Lie” and “Jack’s Run.” For the next 10 years I read both books to each of my 6th grade classes at the beginning of the school year. The kids absolutely loved them! I retired from teaching in 2015. Since then, I reread each book before school starts! My students always complained that I stopped reading at the GOOD part! I also read “Sasquatch,” and the three “Storm Runners” books to my students.